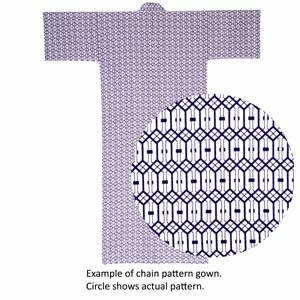 Fully gauze lined yukata (100% cotton) in a blue/white design with matching belt, ideal for wearing as dressing gown. The gauze lining provides extra softness for comfort and warmth. Length (from back of neck): 145cm (57"). Fits height up to approximately 5ft11" and chest/waist < 43".